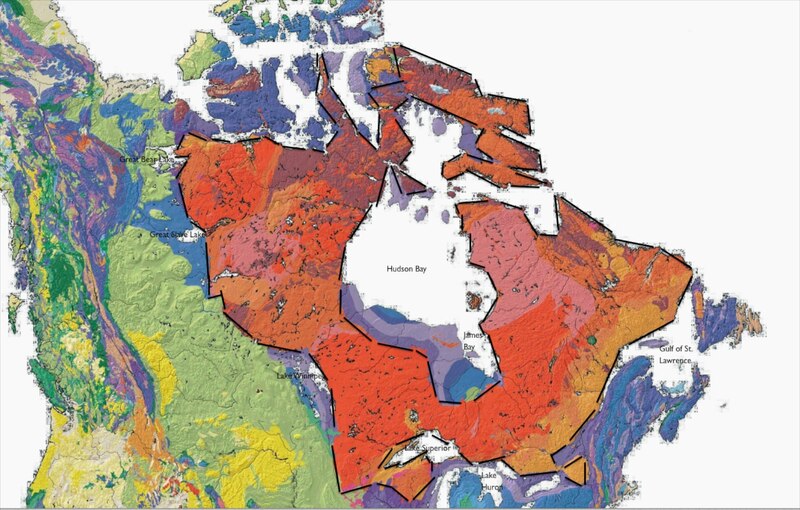 The Canadian Shield (aka the Pre-Cambrian or Laurentian Shield) makes up more than half of Canada’s land mass. 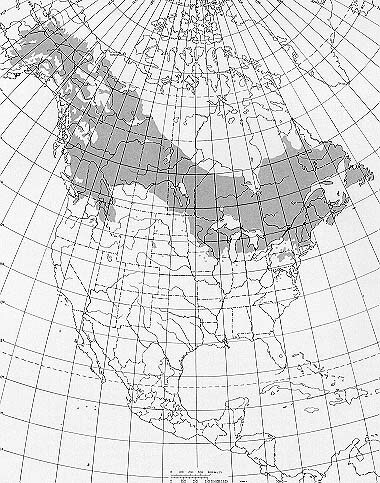 (It also includes Greenland, the Adirondacks of New York State, as well as the northern parts of Michigan, Wisconsin, and Minnesota). It can be thought of as the rock (igneous and metamorphic) foundation or the very bedrock of the plate which is the continent of North America. With the retreat of the last ice sheet which covered most of the northern part of the continent until about 10,000 years ago, the scratches and deep gouges left by the shrinking glacier became the countless rivers and lakes which characterize this vast region. In time a boreal forest established itself on the thin topsoil covering. It was in this unforgiving land that the nomadic Algonquian-speaking peoples fashioned a paleolithic culture based on hunting, fishing, and gathering. 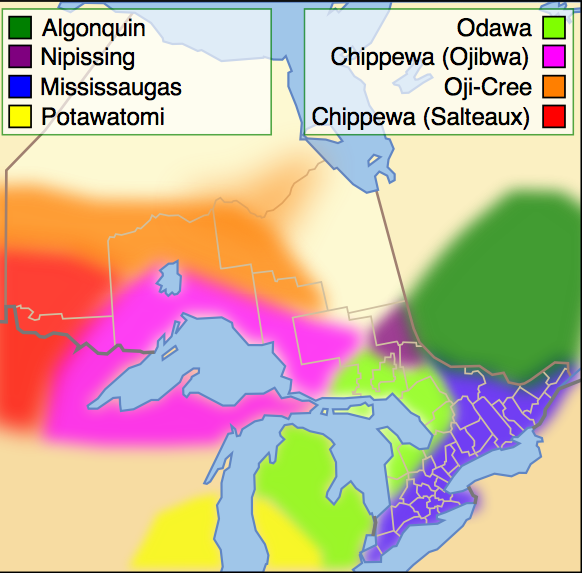 Initially referred to as Indians by the European newcomers, and more recently by a parade of names considered more politically correct such as Aboriginals, Indigenous People, and First Nations People, they know themselves as Anishinaabeg. Darren Baker – see here for the Wikipedia article which is the source of the map. 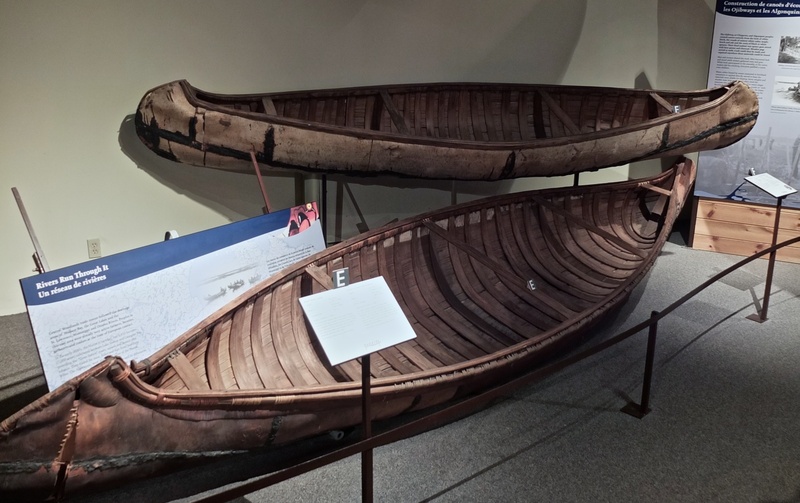 One of their key inventions, the birch bark canoe, allowed them to deal with this difficult terrain. After the coming of the Europeans in the early 1600’s, their millennia-old way of life was overturned by the opportunities and demands of the fur trade. By the 1840’s the newcomers’ attention had turned from the fur trade to the harvesting the forests (spruce and pine) and eventually to the Shield’s mineral wealth (gold, copper, silver, nickel and, more recently, diamonds). The map (credit to Darren Baker) above shows the approximate location of the Anishinaabe and Anishinini peoples around the year 1800. It is this “canoe country” where my brother and I have done almost all our paddling over the past thirty years. A scene like the one below is the reward for negotiating the occasionally fast-moving rapids of its rivers or spending an afternoon paddling into a headwind on a long narrow lake. There are other rewards too – the solitude of a world off the grid, the sights and sounds of nature (a bear scampering off the portage trail or a loon calling out at dusk), and the occasional reminders that we are not the first to travel through this space that others still call their home and “native” land. The reminders come in many forms – ancient portage trails, a collection of four-meter spruce poles leaning upright in the woods, ready to be used again. And at least until now on that rare occasion, seeing fading ochre-coloured pictographs on granite rock faces a couple of meters above the water line. Just two months ago (i.e. March 2013) I had no idea that there were so many pictograph sites in Anishinaabe country waiting to be paddled by and appreciated! 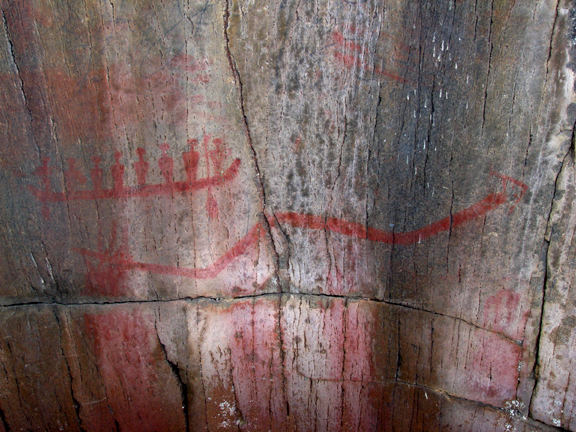 Since there are relatively few pictographs and petroglyphs in northeastern Ontario, my brother and I have managed to do almost all of our canoe trips without seeing more than a couple of examples of what Grace Rajnovich calls “Indian Rock Paintings”. 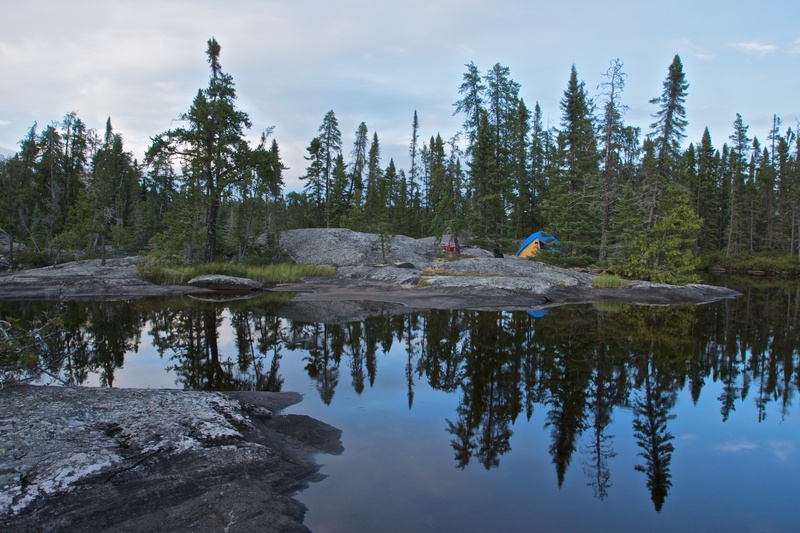 The two sites that stand out from our canoe trips are Fairy Point at the south end of Lake Missinaibi and the rock face on the north arm of Diamond Lake in Temagami. 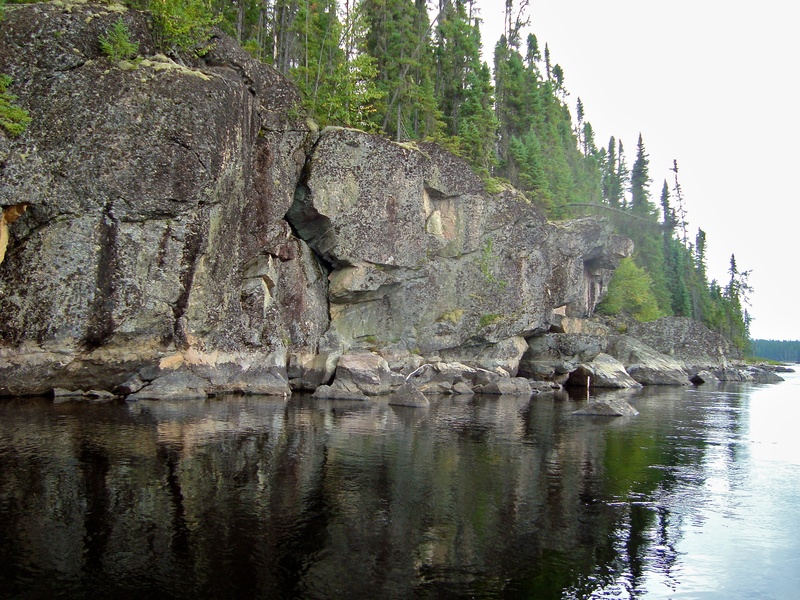 what Dewdney labelled as Face IX at Lake Missinaibi – see here for the image source in a Wikipedia article – thanks to Lester Kovac, a fellow canoe tripper for the shot! In planning for an upcoming canoe trip in the Wabakimi region of NW Ontario, (see here for the related post), I soon found out that we would be canoeing through a major pictograph site, Cliff Lake just north of Lake Nipigon. Needless to say, I was pretty excited at the chance to paddle down this treasure trove of a lake. The fact that I had not even heard about the Cliff Lake pictographs in spite of having already done three two-week canoe trips in the Wabakimi area, provided the motivation to find out more. Update: the following post on Cliff Lake takes a look at what we found! 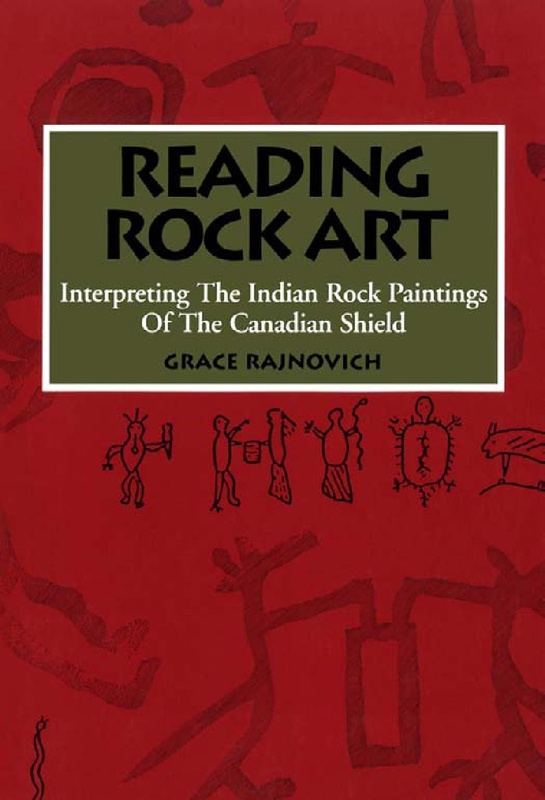 Grace Rajnovich’s Reading Rock Art: Interpreting The Indian Rock Paintings of The Canadian Shield. Selwyn Dewdney’s book was first published in 1962; the second edition in 1967 included another 160 sites that Dewdney and his sons had visited in the interim. (See here for a pdf file with coverage of the additonal sites visited from 1961 to 1966.) A reprint of the 1967 book came out in 1973. As for Rajnovich’s book, it was published in 1994. Dewdney spent his teen years in Kenora after his father was appointed Anglican Bishop of Keewatin District. It was here he developed his canoeing skills, came to love the boreal forest and its rivers, and saw his first pictographs. He is considered the father of the comprehensive study of Indian pictographs in Canada. In all some 103 sites are listed and discussed in the first edition of the book; by 1967 and the second edition he had recorded and analyzed another 160. Rajnovich also worked in Kenora for fourteen years as a field archaeologist for the Ontario government and, clearly inspired by Dewdney’s example, writes in the foreword to Reading Rock Art that her study was meant as “a complement to that classic work”. Rajnovich’s book also has ink illustrations of the pictographs by Ojibway artist Wayne Yerxa. In contrast to Rajnovich’s thematic arrangement, Dewdney’s discussion of the various sites is based on their geographical location. Given that he was primarily an artist, he also provides many sketches made from the side of his canoe, as well as some photographs. These two books are among the best (and also the few!) 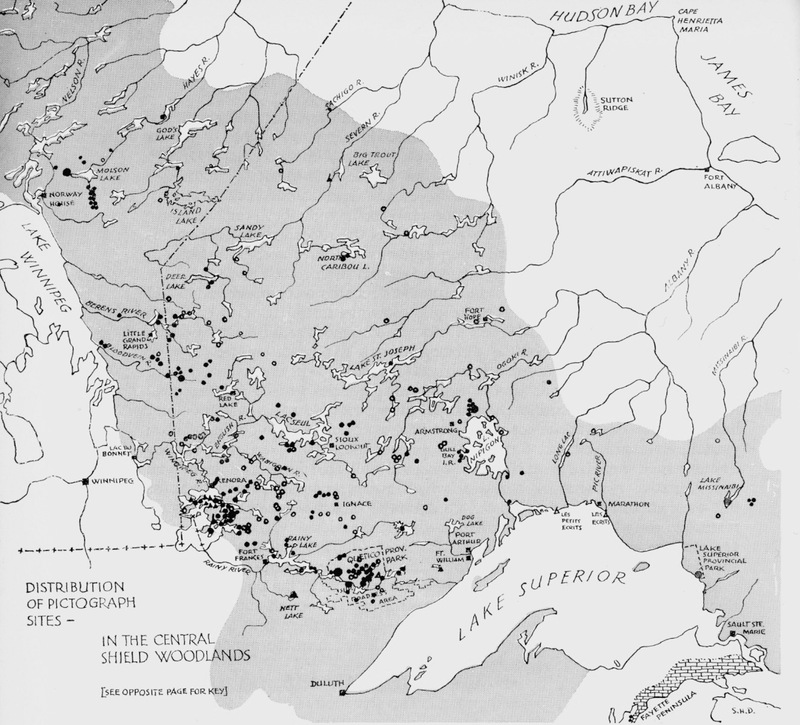 sources of published information about the native rock paintings of the Canadian Shield. They deal with all the basic questions – who and how and why and what and where. And thanks to Dewdney’s effort to incorporate the knowledge of the passing generation of elders that he actively sought out in his travels – the few who knew of the rock paintings and their meaning – these works also preserve at least some of the traditional Anishinaabe worldview. Dewdney’s book is out-of-print and is difficult to find. The Toronto Public Library system has copies of both editions. Recently the University of Toronto allowed the first edition to be included in the Internet Archive. See here to access – you can read it online or download it in various file formats. (Note: I’ve since scanned the material from the second edition and created a pdf file – see here for the 7 Mb download!) Rajnovich’s book is still available at Amazon in print form – and even as a digital download. 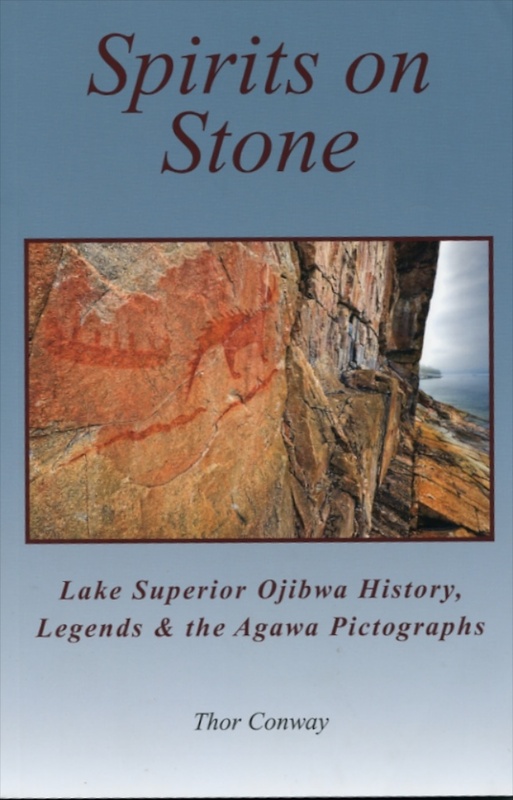 Another excellent book I’ve discovered more recently is the second edition of Thor Conway’s Spirits On Stone: Lake Superior Ojibwa History, Legends & the Agawa Pictographs, which was first published in 1990. The 2010 second edition has about forty pages of additional material and provides a comprehensive analysis. The book is not readily available but I was able to order a copy directly from Conway with info from his website (here). Also listed on the website are a number of other books that fit in perfectly with the theme of pictographs. One title is Painted Dreams, which happens to be the most popular explanation for why the rock paintings were done in the first place. The only Conway title in the Toronto Public Library system is the edition of Spirits On Stone pictured above. 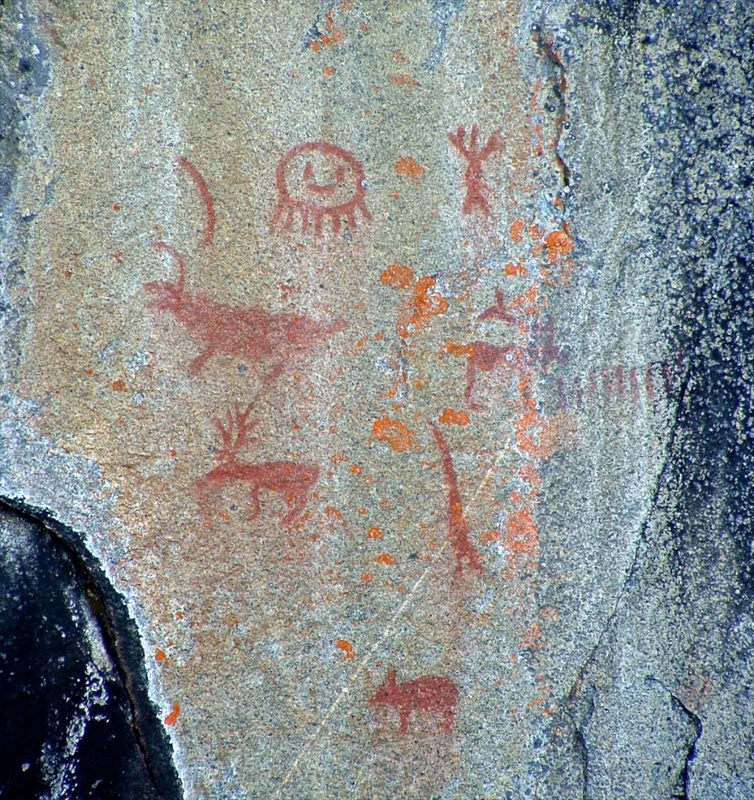 There are over 600 pictograph sites scattered across the Canadian Shield. In this post, I thought I’d create a list of the sites I found mentioned in the works above, as well as in any other sources I’ve stumbled upon in my research. Fellow paddlers may find this information useful in planning their next canoe trip; it may even prompt some to visit areas not yet explored specifically to see these pictographs “up close and personal”. The list falls way short of being complete – but it is a start! I was just going to focus on my home province of Ontario but having collected the names of sites located elsewhere, it seemed a waste not to put the information out there. Here is the map – in two parts – from Dewdney’s book which pushed me to identify more exactly the sites he had indicated. Given that his work dates back to the 1960’s – a half-century ago – there are now quite a few more dots that could be put on the maps! 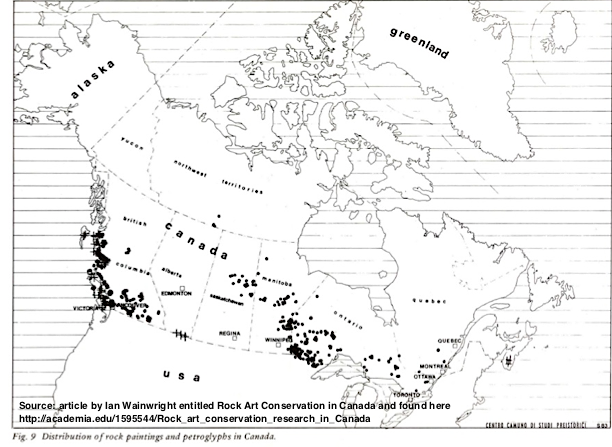 The map below shows the distribution of pictograph and petroglyph sites in Canada as a whole and puts the Canadian Shield pictograph sites in context. Perhaps someone will create another post detailing the many sites in British Columbia. For an overview and a global perspective, check out the Wikipedia article entitled “Rock Art“. Among other things, it makes clear the difference between pictographs and petroglyphs, as well as providing a useful list of external links to other sources. 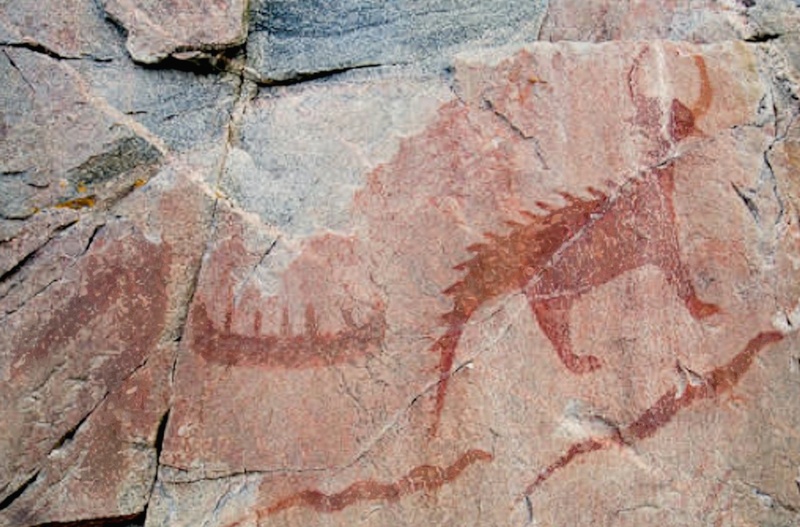 “Pictographs and Petroglyphs“, an entry written by Joan Vastokas (then of Trent University in Peterborough and the co-writer of a study of the Peterborough Petroglyphs) in the online version of The Canadian Encyclopedia. She provides an excellent overview and concludes with a brief summary of the research history as well as links to other useful sites. 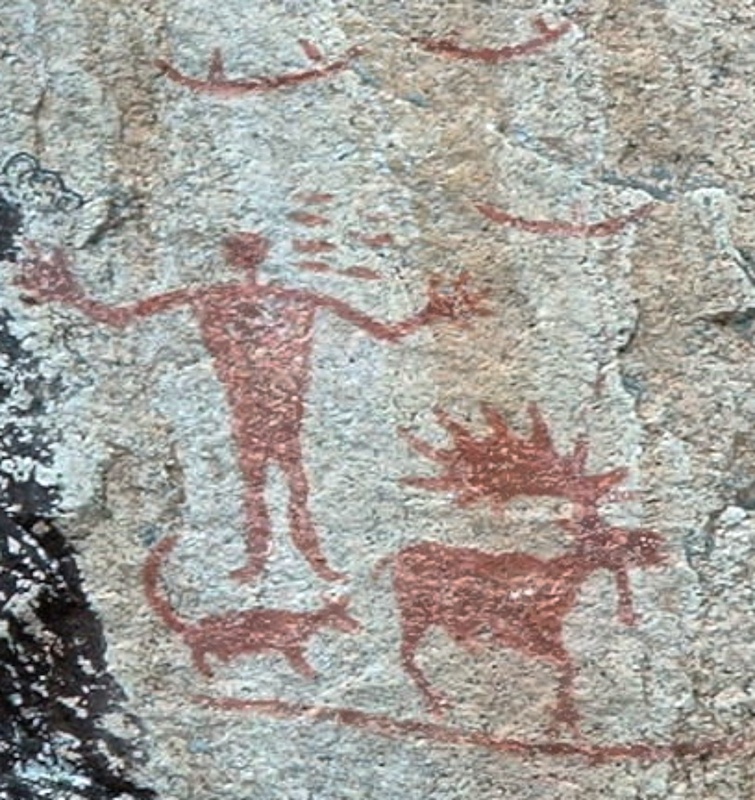 “Visions On Rock“, a web page about the pictographs of Lac La Ronge Provincial Park in Saskatchewan (part of the Churchill River System). Tim Jones, the author of the 1981 book on the pictographs of the Churchill River system, provides a number of interesting quotes. Google Books has almost an entire chapter from Bob Henderson’s Every Trail has A Story: Heritage Travel in Canada. It’s Chapter 10 (Rock Art: A Lifelong Quest and Mystery). Scroll back to p.149 for the beginning of the chapter. Henderson provides detail on three particular sites – the two Ontario sites of McCarthy Bay and Cliff Lake, and the Hickson-Maribelli Lakes site in Saskatchewan. A 2008 article entitled Des peintures et des offrandes: Recherches récentes en art rupestre de l’Ontario by Serge Lemaitre and Valerie Decart is available on the érudit web site. 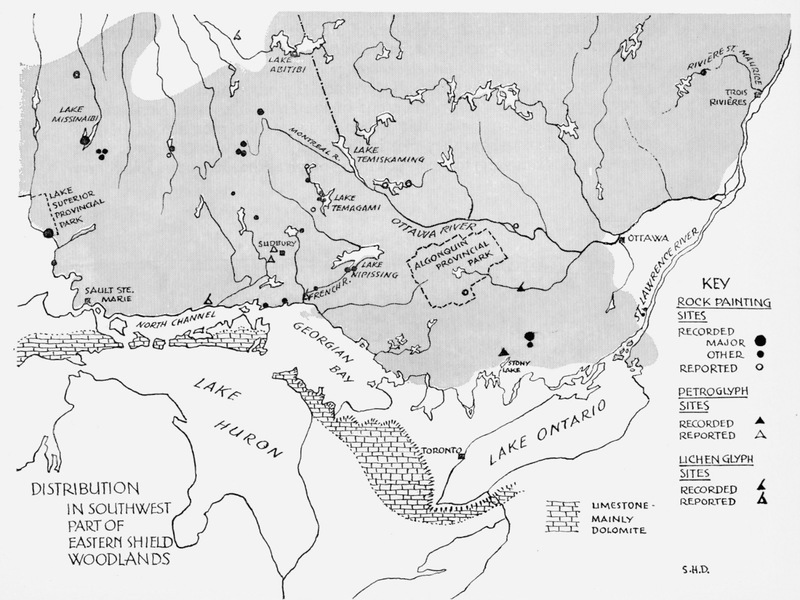 Click here to read their study of pictographs based on the following Ontario sites stretching from Lake Nipigon to the Quebec/Ontario border – the Nipigon River; Worthington Bay; Devil’s Warehouse Island; Upper Grassy Lake; Gros Cap; Chiblow Lake; Lake Temagami; and Matachewan Lake. Click here for a Google map of the various locations. The article concludes with a useful bibliography which could serve as a checklist of some of the best material in print. You will either be reading the article in French and/or making use of Google’s translate feature! One new word in my vocabulary after working my way through is the word rupestre, which turns out to be the word used in French in lieu of the English “pictograph” or “rock painting”. The Google translator confusingly translates it as “cave”. The first forty-five pages of Edward J. Lenik’s 2009 work Making PIctures in Stone: American Indian Rock Art of the Northeast is accessible at Google Books here. Of particular interest is chapter 1 – “Algonquian People in the Northeast” (pages 1-8). Scattered across the Boundary waters and Quetico, left by its native people on canvases of stone, are hundreds of enigmatic paintings. Generations of canoe country travelers have wondered what these mysterious drawings might mean. Now, in this book, award-winning author Michael Furtman presents a comprehensive guide to the canoe country’s known pictographs and provides insight into the artists’ visions and the traditions that spawned them. Complete with maps and directions to dozens of sites, and the most accurate reproductions of pictographs to date, Magic on the Rocks is an indispensable tool for those who would respectfully visit the sacred sites of a wise and ancient culture. Furtman does an especially good job of the Quetico pictograph sites; my copy will definitely be in one of the packs when we get there. Pictographs come up occasionally in the members’ forum at myccr.com. I entered the term in the search window and came up with hundreds of references, with some threads dealing in-depth with various aspects of the topic. Click here if you want to while away an hour or two! This particular Canadian Canoe Routes forum thread from 2006 entitled Wabakimi Pictograph Locations had specific information about the Cliff Lake pictographs as well as a discussion about what it all means and whether we should even be making public the locations of the pictographs. While I too have seen the graffiti left by Greek travellers on the inside walls of the pyramids of Giza, I am obviously not one of those who would argue that we should, therefore, hush up about the whereabouts of the pictographs. 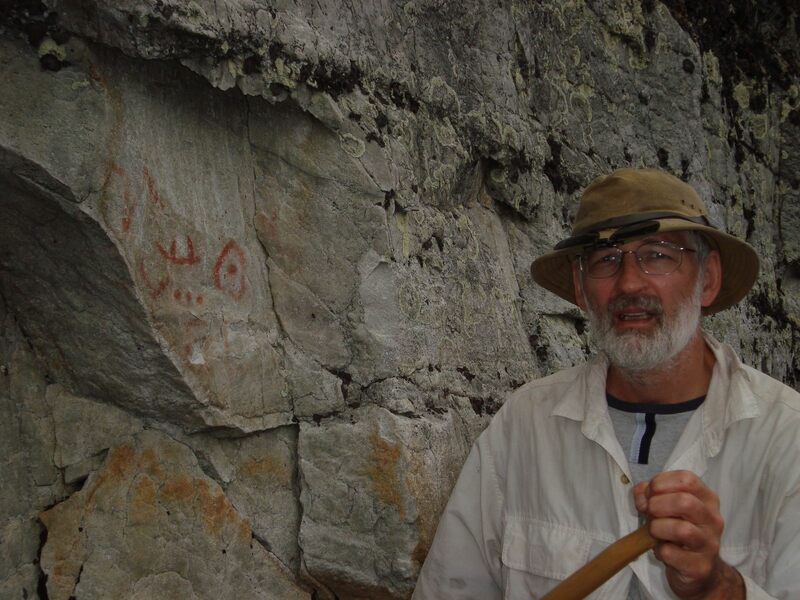 Education and helping others to appreciate the significance of the pictographs is the way to go for this retired school teacher. The forum at the BWCA website has a number of posts which deal with pictograph sites and how to get to them. Click here and enter “pictograph” in the search window to see the discussion. 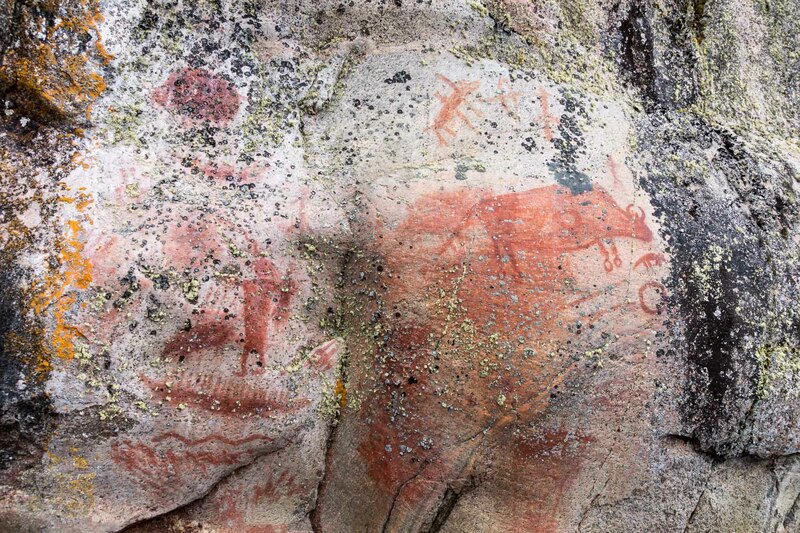 The Pictographs of Wabakimi’s Cliff Lake – Selwyn Dewdney Takes Us On A Tour. Also, check out the Anishinaabe Rock Art folder in the site header for links to all posts dealing with the various pictograph locations we have visited more recently. 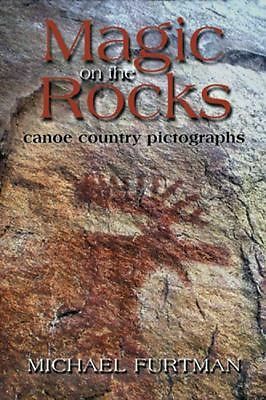 This entry was posted in Anishinaabek World, Pictographs of the Canadian Shield, wilderness canoe tripping and tagged aboriginal rock art, Anishinaabeg art, art ruprestre du bouclier canadien, canadian shield pictographs, Grace Rajnovtich, Indian pictograph locations, indian rock paintings, Selwyn Dewdney and Indian rock paintings, Thor Conway pictographs. Bookmark the permalink. Kate, the Bloodvein is definitely on the list of rivers I’ve got to paddle! Let me know if you upload some pix of the pictographs and I will put the link in my post. I am a big fan of Selwyn Dewdney’s research. Thanks for posting. Bruce, ten months ago I had no idea who Selwyn Dewdney was! 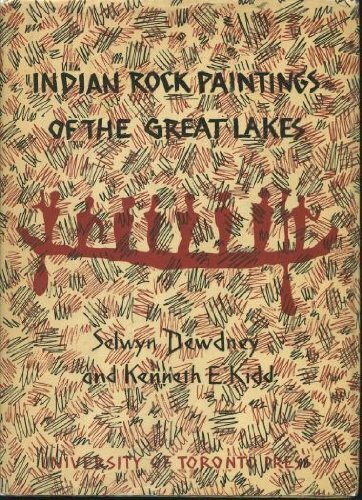 Since then I have gone through his Indian Rock Paintings of the Great Lakes more than once, picked up his autobiographical Daylight In the Swamp, and read through his early 70’s book on the birchbark scrolls. He also got me to look at Norval Morrisseau again in a different light. It really has been the year of Selwyn Dewdney for me. Nice to hear that there are others who know of his work. Next summer he is coming along as my bro and I paddle down the Bloodvein River and check out the dozen pictograph sites along the way. BTW, did you take a look at my two posts on the Cliff Lake pictographs? – they are definitely inspired by Dewdney. I hope to do the same with the Bloodvein and the Missinaibi area as I did with Cliff Lake – i.e. incorporate bits of Dewdney’s text and graphics into my presentation of the pictographs as they are now. Shirley, go right ahead and make use of them. It’s nice to think that they provoked that kind of response! Shirley, I saw the link to your blog and paid a visit. There was more than one landscape I could just have paddled my canoe into! Enticing, peaceful, iconic…What a great series of paintings! I’ve just learned of pictographs on Black Birch Lake, about 300 km north of Kenora. I didn’t see reference to them at this website and wonder if you know of them? There is a nice moose, a human figure similar to the one you show from Hegman Lake, and other familiar images, but then there is one scene that seems quite unusual, showing images unlike any i’ve seen in other references. Eric, thanks for getting in touch. No, I’ve never seen mention of Black Birch Lake as a pictograph site. I did go through the Dewdney book to see if he had been anywhere near there in his travels. He has drawings he made in 1959 at a Cochrane River site just down from Black Birch Lake. If you have any pix you took and would be okay sharing them then send me the link where people could access them – or send the jpg files to me and I will upload them. I’m wondering if there was any way to get permission to use one of your images for a project my students are working on. THey’re building an interactive rock climbing wall that will be presented at an event next week, and we thought a background image of an iconic aboriginal rock image would be appropriate. Please contact me if you’re interested and I can provide some more information. It may be too short a turn around time, and you may be away, but Thanks for considering it..
Jason, some of the pictographs are, as you write, truly iconic. The only problem I have with you putting the pictograph image(s) on the rock wall is this – instead of people sitting in front of the image and thinking of it as an important dimension of traditional Anishinaabe spirituality, you’d have people scampering all over the image and scuffing it and unintentionally disrespecting it. I’ve gotten some of that just for posting my pix on the net. I have also noticed a few sections of rock face at Bon Echo – also known as Mazinaw Rock for its collection of Algonkian rock paintings – where climbers seem to have scuffed the rock surface very close to the ochre paintings. With my comments in mind, feel free to use the images that you want. I’ll leave it to you to use it/them appropriately. It may be a teachable moment! We’re thinking of traveling to the eastern Manitoba and western Ontario area, are there examples of rock art that can be reached by hiking? Mike, I am not aware of any sites accessible by foot in eastern Manitoba or northwestern Ontario. The Bloodvein River is the furthest west we’ve been on our pictograph/canoe trips. We’ve also never visited Quetico or Lake of the Woods! I cannot think of any of the sites I have listed in those two areas as being accessible by foot. 2. the Peterborough Petroglyphs just north of Peterborough. Could luck with your pictograph quest!